The shaft is used to transfer energy from the motor to the impeller.The most common shaft materials are carbon steel and stainless steel.Each shaft is supported by bearing that support loads along the shaft called thrust loads, and loads at right angles to the shaft. 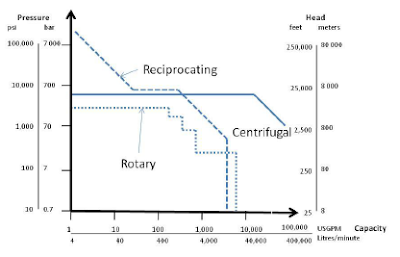 called radial loads.The bearings may or may not be a part of the motor. Closed Impeller - When an impeller has a shroud in the front and in the back. Open Impeller - When there is no shrouds. With closed impellers, the impeller fits very close to the case. 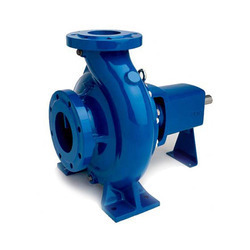 As a result, the case is worn by material passing from the high-pressure side to the low-pressure side of the impeller. To protect the case, brass or stainless steel wear rings are inserted into the case. Around the impeller is the volute case. The volute case gathers the water thrown from the impeller and directs it in a single direction. Attached to, and sometimes part of, the backing plate is the stuffing box. The stuffing box is where material that controls the leakage of water from around the shaft is placed. 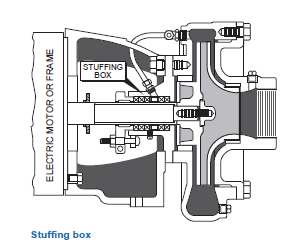 The material placed in the stuffing box is either packing or a mechanical seal. 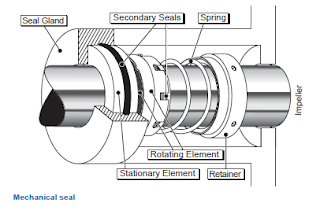 Packing and mechanical seals serve the same purpose: they control leakage through the stuffing box. 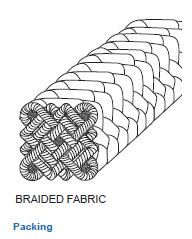 Packing is composed of some type of fiber, like cotton, and some type of lubricant, like graphite or Teflon-TM. A mechanical seal is composed of two finely machined surfaces, one hard and one soft, that prevent water from passing. When installing packing, joints should be staggered. In order to control leakage with packing, pressure must be placed on the packing. This pressure is applied by the packing gland, two pieces of metal at the back of the stuffing box. It is often desirable to lubricate and cool the packing with external water or oil. When water is used, it is called seal water or flush water. The seal water is distributed into the stuffing box through the lantern ring, which is commonly a brass ring with holes that allow the water to easily pass. To protect the shaft from damage due to the packing, a shaft sleeve can be installed. A shaft sleeve is a brass or stainless steel sleeve that fits tightly over the shaft. So in this article we discussed about the components in end suction and split case configurations of centrifugal pumps.In next article we are going to discuss about suction piping and conditions.